A local teen is collecting coins for a good cause and wants her peers to spare some to help make a positive change in the community. Isabel “Izzy” Bellino, 16, of Newport Coast, a junior at Orange County School of the Arts in Santa Ana, started the campus club, Spare Change for Change, last year. 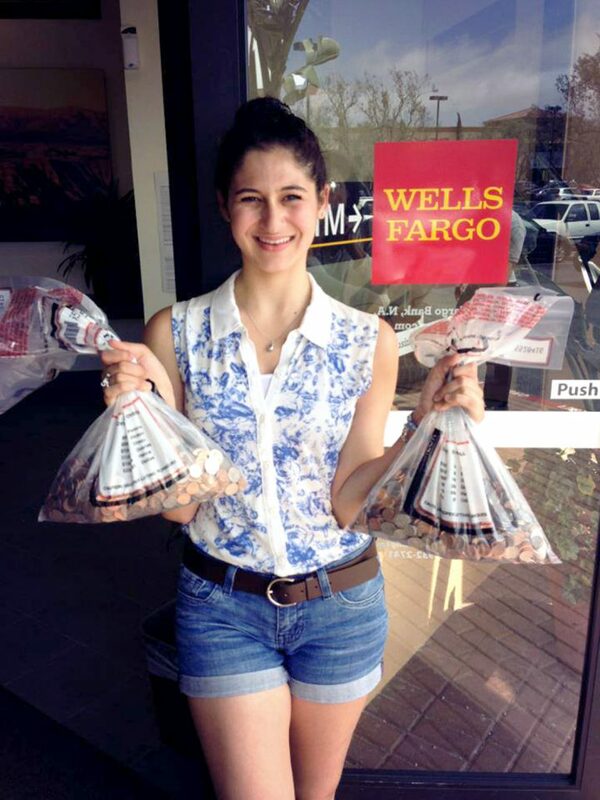 Isabel Bellino presents OCSA’s collected coins to Wells Fargo Bank at the end of the 2012-2013 school year. 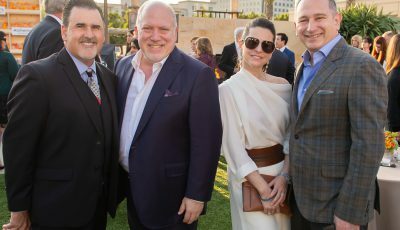 The philanthropic group aims to raise funds to support the Orangewood Children’s Foundation, which supports abused, neglected, and abandoned kids in Orange County. The club also seeks to raise awareness about the needs of at-risk youth in the community. Bellino fought for the attention of other students this week against about 120 other groups at her school’s club rush. And new this year is a branch of the club at Corona del Mar High School. President of the CdM group will be junior Cameron Klein, 16, of Newport Beach. Club rush at CdM is in October. 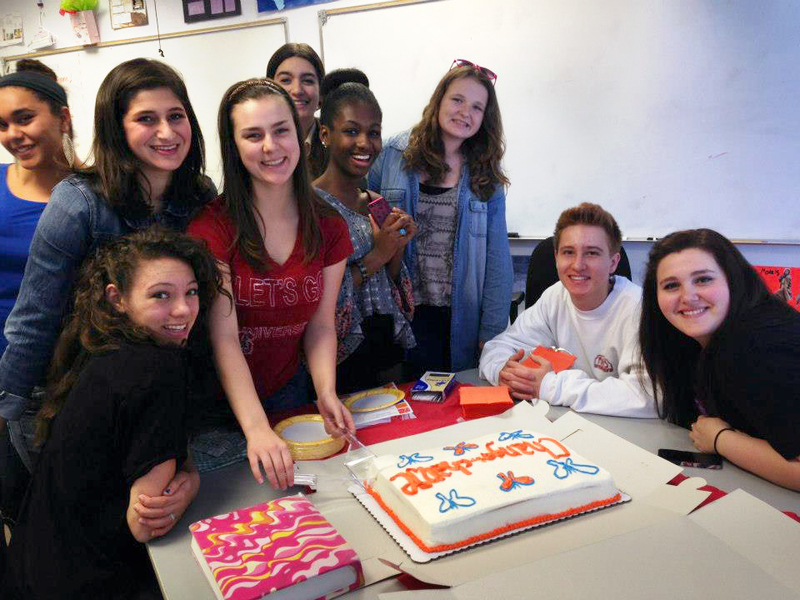 It all started several years ago in 2010 as Bellino’s bat mitzvah project. “My dad always had these spare coins and he would just disregard them and they would go to complete waste,” she said. She and her mom once found about $20 worth of loose change in her dad’s car, she recalled. The two went out for ice cream, but Bellino had bigger dreams for all that coin. “We started talking about it… ‘This is so easy to make a big difference,’” she said. Spare Change for Change founder Isabel Bellino and the CdMHS branch president, Cameron Klein. So the seventh grader sent out bottles to her friends and family, including Klein (both teens attended CdM Middle School at the time), and collected all their spare change. She also sold cookies at Temple Bat Yahm in Newport Beach every Wednesday. Within a year, SC4C had raised over $1,000 for Orangewood Children’s Foundation. “We counted every single coin, to the last penny,” she said. On top of the funds she raised, Bellino had items from Orangewood’s wish list as the table centerpieces at her bat mitzvah celebration. Since then, she has continued collecting change as her own personal project. When she became a sophomore at OCSA she wanted to include other students and expand on the idea. It was important to her to keep the initiative going, she said, and get others motivated to help. It officially started as a school club last year. The club had between 20 and 30 members during the year. They also got school faculty and staff members involved. She also had Orangewood Children’s Foundation’s program manager, Kristi Piatkowski, come and speak to the group. 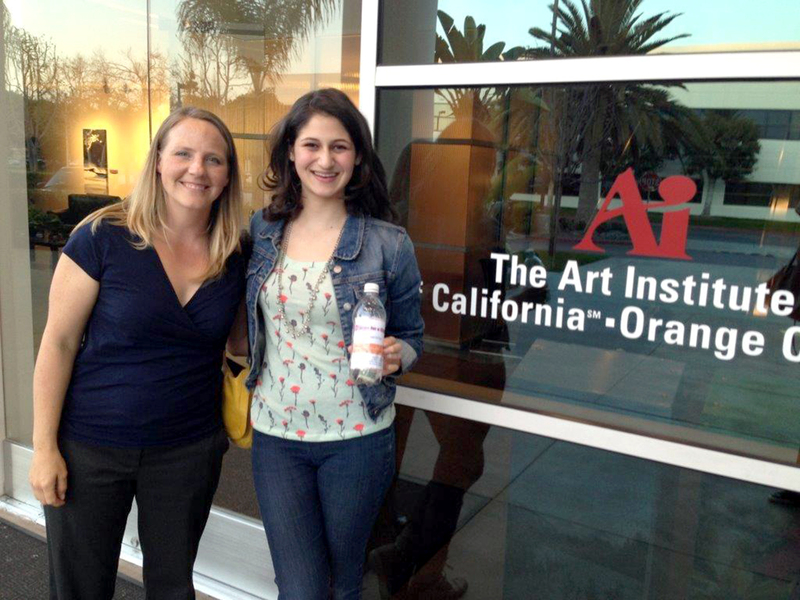 Kristi Piatkowski and Isabel Bellino at the Art Institute of California-Orange County after a meeting with design students to discuss the new logo. She shared several stories of successful Orangewood youth. “There are amazing (people) that come out of Orangewood,” Bellino added. Last year, the club raised more than $1,000 for the foundation. For his part, Kirk has been there every step of the way, collecting coins, supporting Bellino and staying involved. “It made sense for him to start his own chapter at CdM,” Bellino said. Klein was on a leadership program at CdM call Peer Assistance Leadership and had knowledge on how to start and manage a club. It gave him the qualities of a leader, he said. He was brainstorming with Bellino about how to push the club on social media when he thought about expanding it onto the CdM campus. Spare Change for Change club members celebrate a meeting with Kristi Piatkowski with cake for everyone. 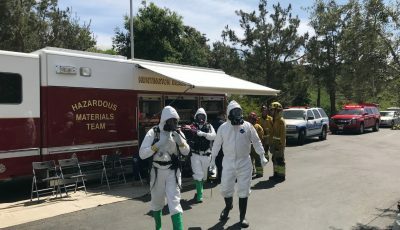 “I thought, ‘This would be a wonderful thing to do at Corona del Mar as well,’” he said. Starting a club also boosts self-confidence, pride and a sense of service, Klein said. It has also encouraged him to want to continue giving back in the future, no matter where life takes him, he added. So Klein’s initiative to start a CdM branch of the club, spurred Bellino over the summer to create a package to hand out to other students at other schools. A group is already in the works at University High School in Irvine and they are in talks with several other local schools, Bellino said. It would be great if the club could eventually become an official 501c(3) nonprofit, she said. But in the near future, she would like to see more teens involved. “(I want to get some more) peer support, open their eyes to what’s out there, outside the OC bubble,” she said. 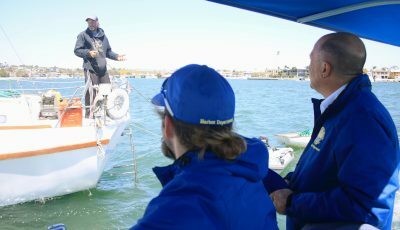 The world outside of Newport is diverse, Klein said. 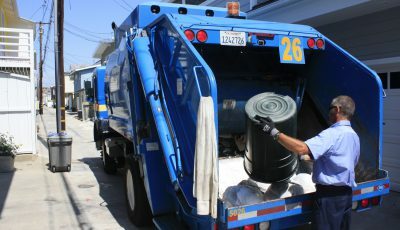 There are a lot of people and other youth that need help, which is not something most kids see locally in Newport Beach, he explained. “(Some kids) are scared of what’s out there,” he said. 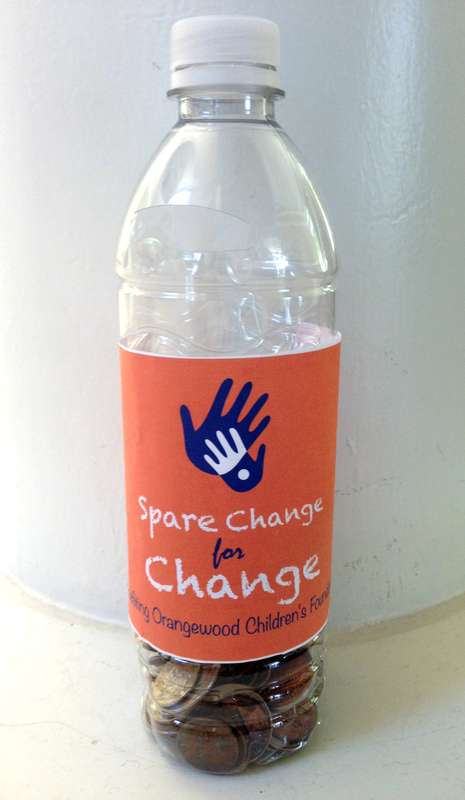 A Spare Change for Change collection bottle. He hopes to inspire his peers to open their minds and act selflessly by helping others less fortunate, he said. It has been quite the education for both of them as well, they agreed. 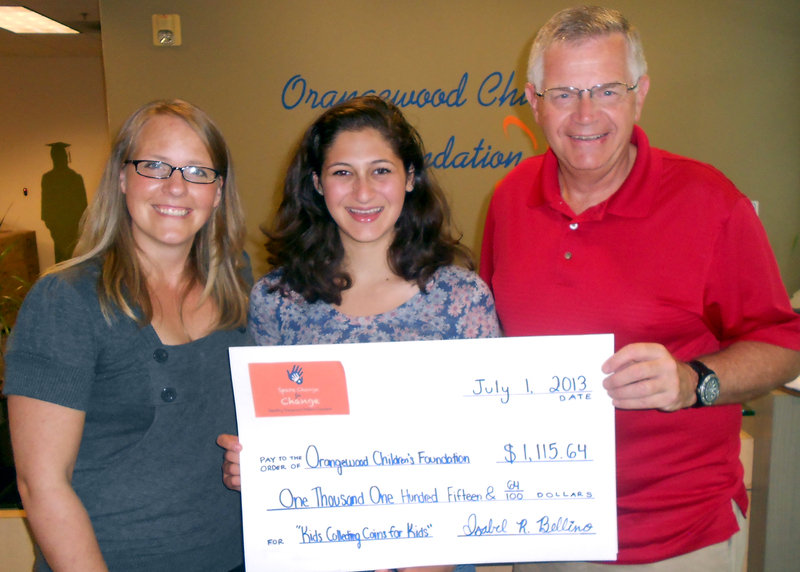 The club’s money goes toward Orangewood’s resource center for emancipated youth. There, they can get groceries, toiletries, daycare for teen moms, counseling, help with job searches, and more. “It’s basically their support system,” Bellino said. Since Wells Fargo has waived the fee usually charged with counting change for the club, 100 percent of the money goes to Orangewood. Actually giving the check to Orangewood was an amazing experience and seeing their reactions, Bellino said. That was a special moment, she added. For more information, visit sparechangeforchange.com. Isabel Bellino presents a $1,115.64 check to Cal Winslow, Orangewood Children’s Foundation’s CEO, and Kristi Piatkowski, the foundation’s volunteer program manager. Lynn’s Spin: Go Purple OC!